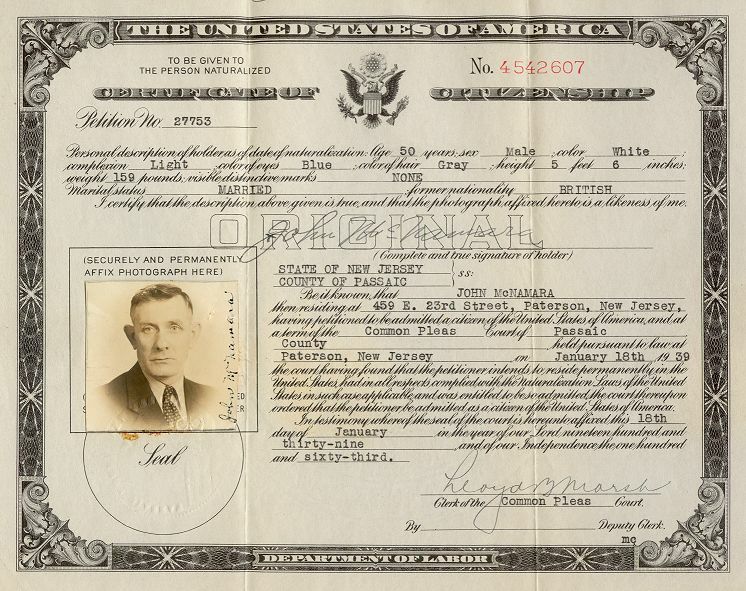 Above is my father’s Certificate of United States Citizenship, which he obtained on January 18, 1939. It may seem surprising that he resided in the U.S. for nearly 35 years before becoming a citizen, but it would not have been unusual in that era. I suspect that he finally went through the formalities of becoming a U.S. citizen in the late 1930s for practical reasons. He worked in the offices of the Railway Express Agency in Jersey City, New Jersey, which was a busy railroad hub at that time. And as war clouds were forming over Europe, there was already a lot of talk about the potential for sabotage of the American transportation system. Anyone having anything to do with transportation might be viewed as a potential security risk, and so it would have been prudent to finalize the citizenship process. Note that the Citizenship Certificate says my father’s former nationality was “British.” So far as the U.S. government was concerned that was technically accurate, as Ireland was still considered part of the British Empire when my father lived there. But believe me, it would not have been a wise move to call him British to his face.